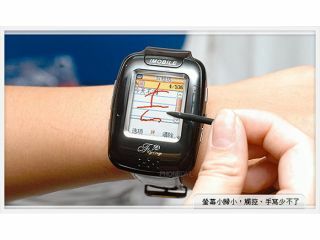 IMobile's Flying C1000 isn't the first wristwatch phone but it's certainly the most feature packed. With a name like the Flying C1000, you'd think the latest technical marvel from those masters of budget innovation in China might be a knock-off Harley or perhaps a stab at a hovercar, but the pleasant surprise is that it's actually a GSM wristwatch phone. The tiny marvel, to be handled in China by storied distributor iMobile, is currently unpriced and is yet to go on sale there, but is sure to be a hit when it does. It's not clear what OS the C1000 uses - we'd put money on it being some kind of Linux - to power its PDA functions, media players, Bluetooth, camera and touch-sensitive colour display. We do know that the tri-band (GSM 900, 1800, 1900) phone operates as a speaker phone, requiring the user to shout at it and that it has a mini USB jack for connecting to a PC. In spite of the full hand of software onboard, a mere 60MB of memory and the lack of expansion options mean the C1000 won't be seeing much multimedia action. There's also a stylus for drawing on the screen hidden away in the base of the strap. The tiny display can be used for character recognition (Chinese only, naturally), but considering a size of 176 x 220 pixels, a jeweller's loupe might be a wise investment too.